Over 60 learner string players attended the Celebration of Young Strings workshop and performance on Sunday 31 March 2019. The project marks the launch of a new partnership with Norfolk Music Hub, North Norfolk District Council, Orchestras Live and Gresham’s School. Each of these organisations is passionate about creating opportunities for children and young people to engage in musical experiences, and the weekend was full of such opportunities. 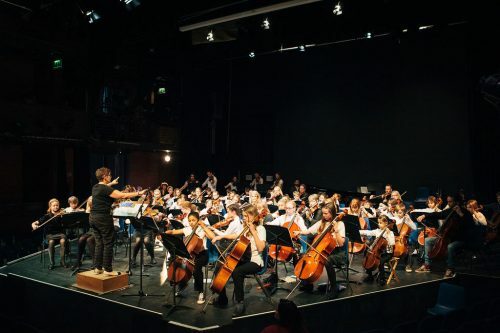 Children and young people had the opportunity to see professional musicians from City of London Sinfonia in action in their open rehearsal and public concert on the Saturday evening, free of charge. The young players then joined together on the Sunday, engaging in sectional rehearsals and workshops on four pieces, supported by two players from City of London Sinfonia and specialist music tutors from Norfolk Music Service. The childrens’ behaviour throughout the day was exemplary and their enthusiasm, concentration and progress were all outstanding. At the end of the workshop the young string players took to the stage at the Auden Theatre in a massed ensemble to perform the pieces to their families and friends. This performance featured a showcase of advanced players from Fakenham Academy as well as younger players who shined as soloists, accompanied by their peers. It was great opportunity for younger players to hear more experienced performers and inspire them to consider how they would like to continue with their musical journeys. We would like to thank our partners and staff for facilitating this wonderful event as well as the parents for bringing their children along on Mothering Sunday and supporting the weekend’s activities as a whole. If you attended any part of the weekend we would appreciate your feedback and your child’s responses to help us plan future events.